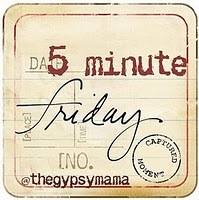 It's time again for Five Minute Friday. We write for five minutes flat without worrying if it's perfect. Please click over to The Gypsy Mama for instructions and to join in! Life has returned to what will be the new normal for me as a single Mother. I find happiness in my children, my friends and my small accomplishments. Yet, my heart still aches from the pain of an unexpected divorce and the love I still carry for the man that was supposed to be mine forever. I find myself pondering over the last time I saw him, a few days ago, when things seemed strangely normal. We were able to talk without that edge of hostility. Talk a lot. And laugh. All foreign things since everything started. We have been talking since. Not just about the girls, but about likes and dislikes, music, every day things. It is friendly, and I don't quite know what to make of it. I don't take time to question it too much. It is nice to be friends for once. Do you think you could meet me to talk? Little did I know, that would be the first step to our second beginning. I am so grateful I said, "Yes." What has come from the unexpected moments in your life?